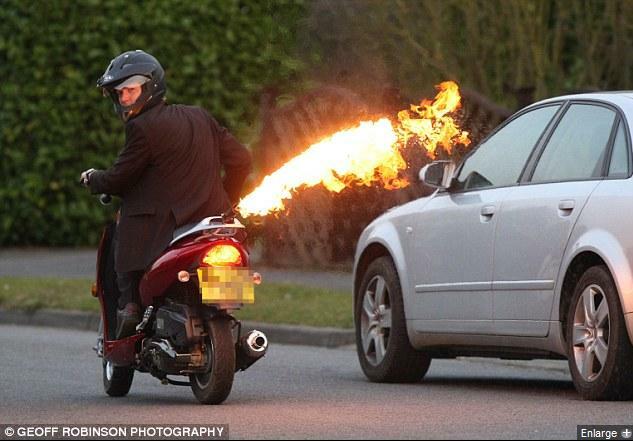 Fed up with car drivers who behave like idiots on the roads and knock you off your bike? Fed up with hearing the same grumpy car drivers insulting you and treating you of rogue motorcyclist, when all you’re doing is use a greener and more economical mode of transport? 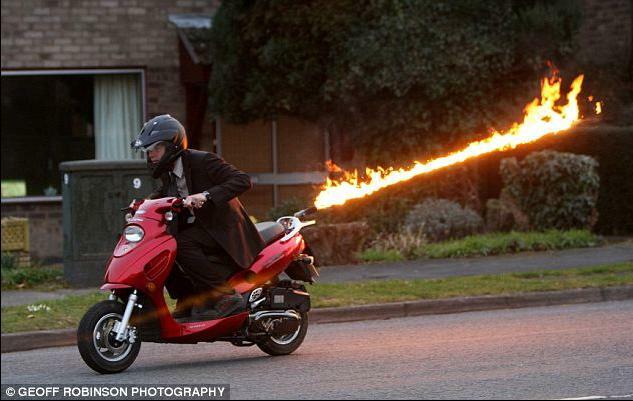 Here is the solution, invented by a 30 years old English plummer, to make a car stay away from your bike and have a bit of peace on the roads: a revolutionary flame-throwing scooter! Ok, how much is it? Does that include fitting? How long is the waiting list? Sadly, the owner of this moped was arrested by police after photos of him riding on a public highway were published in newspapers. He was arrested for a FIREARMS OFFENCE! Poor bloke, he was only having a bit of fun. I hope the charges are dropped.